Last Monday’s article on the Trillion Planet Survey led to an email conversation with Phil Lubin, its founder, in which the topic of Breakthrough Starshot invariably came up. When I’ve spoken to Dr. Lubin before, it’s been at meetings related to Starshot or presentations on his DE-STAR concept. Standing for Directed Energy System for Targeting of Asteroids and exploRation, DE-STAR is a phased laser array that could drive a small payload to high velocities. We’ve often looked in these pages at the rich history of beamed propulsion, but how did the DE-STAR concept evolve in Lubin’s work for NASA’s Innovative Advanced Concepts office, and what was the path that led it to the Breakthrough Starshot team? The timeline below gives the answer, and it’s timely because a number of readers have asked me about this connection. Dr. Lubin is a professor of physics at UC-Santa Barbara whose primary research beyond DE-STAR has involved the early universe in millimeter wavelength bands, and a co-investigator on the Planck mission with more than 400 papers to his credit. He is co-recipient of the 2006 Gruber Prize in Cosmology along with the COBE science team for their groundbreaking work in cosmology. Below, he tells us how DE-STAR emerged. 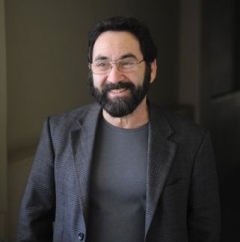 June 2009: Philip Lubin begins work on large scale directed energy systems at UC Santa Barbara. Baseline developed is laser phased array using MOPA [master oscillator power amplifier, a configuration consisting of a master laser (or seed laser) and an optical amplifier to boost the output power] topology. The DE system using this topology is named DE-STAR (Directed Energy System for Targeting Asteroids and exploRation). Initial focus is on planetary defense and relativistic propulsion. Development program begins. More than 250 students involved in DE R&D at UCSB since. February 14, 2013: UCSB group has press release about DE-STAR program to generate public discussion about applications of DE to planetary defense in anticipation of February 15 asteroid 2012 DA14, which was to come within geosync orbit. On February 15 Chelyabinsk meteor/asteroid hit. This singular coincidence of press release and hit the next day generated a significant change in interest in possible use of large scale DE for space applications. This “pushed the DE ball over the hill”. August 2013: Philip Lubin and group begin publication of detailed technical papers in multiple journals. DE-STAR program is introduced at invited SPIE [Society of Photo-optical Instrumentation Engineers] plenary talk in San Diego at Annual Photonics meeting. More than 50 technical papers and nearly 100 colloquia from his group have emerged since then. List of DE-STAR papers can be found here. August 2013: 1st Interstellar Congress held in Dallas, Texas by Icarus Interstellar. Eric Malroy introduces concepts for the use of nanomaterials in sails. August 2013: First proposal submitted to NASA for DE-STAR system from UC Santa Barbara. January 2014: Work begins on extending previous UCSB paper to much longer “roadmap” paper which becomes “A Roadmap to Interstellar Flight” (see below). February 11, 2014 – Lubin gives colloquium on DE-STAR at the SETI Institute in Mountain View, CA. Summarizes UCSB DE program for planetary defense, relativistic propulsion and implications for SETI. SETI Institute researchers suggest Lubin speak with NASA Ames director Pete Worden as he was not at the talk. Worden eventually leaves Ames a year later on March 31, 2015 to go to the Breakthrough Foundation. Lubin and Worden do not meet until 18 months later at the Santa Clara 100YSS meeting (see below). August 2014: Second proposal submitted to NASA for DE-STAR driven relativistic spacecraft. Known as DEEP-IN (Directed Energy Propulsion for Interstellar Exploration). Accepted and funded by NASA NIAC program as Phase I program. Program includes directed energy phased array driving wafer scale spacecraft as one option [Phase 1 report “A Roadmap to Interstellar Flight” available here]. April 2015: Lubin submits the “roadmap” paper to the Journal of the British Interplanetary Society. June 2015: Lubin presents DE driven relativistic flight at Caltech Keck Institute meeting. Meets with Emmett and Glady W Technology Fund. August 31, 2015: August 31, 2015: Lubin and Pete Worden attend 100YSS (100 Year Star Ship) conference in Santa Clara, CA [Worden is now executive director, Breakthrough Starshot, and former director of NASA Ames Research Center]. Lubin is invited by Mae Jemison (director of 100YSS) to give a talk about the UCSB NASA DE program as a viable path to interstellar flight. Worden has to leave before Lubin’s talk, but in a hallway meeting Lubin informs Worden of the UCSB NASA Phase I NASA program for DE driven relativistic flight. This meeting takes places as Lubin recalls Feb 2014 SETI meeting where a discussion with Worden is suggested. Worden asks for further information about the NASA program and Lubin sends Worden the paper “A Roadmap to Interstellar Flight” summarizing the NASA DEEP-IN program. Worden subsequently forwards paper to Yuri Milner. December 16, 2015: Lubin, Worden and Pete Klupar [chief engineer at Breakthrough Prize Foundation] meet at NASA Ames to discuss DEEP-IN program and “roadmap” paper. December 2015: Milner calls for meeting with Lubin to discuss DEEP-IN program, “roadmap” paper and the prospects for relativistic flight. January 2016: Private sector funding of UCSB DE for relativistic flight effort by Emmett and Glady W Technology Fund begins. Unknown to public – anonymous investor greatly enhances UCSB DE effort. January 2016: First meeting with Milner in Palo Alto. Present are Lubin, Milner, Avi Loeb (Harvard University), Worden and Klupar. Milner sends “roadmap” paper to be reviewed by other physicists. A long series of calls and meetings ensue. This begins the birth of Breakthrough Starshot program. March 2016 – NASA Phase II proposal for DEEP-IN submitted. Renamed Starlight subsequently. Accepted and funded by NASA. March 2016: After multiple reviews of Lubin “roadmap” paper by independent scientists, Breakthrough Initiatives endorses idea of DE driven relativistic flight. April 12, 2016: Public release of Breakthrough Starshot. Hawking endorses idea at NY public announcement. I’m interested in knowing how low in frequency a maser can be made such as around 10KHz? Does the maser cavity length have to be on the order of the wavelength? Thanks. 10 kHz requires huge cavity size (but need such things only as antennas), but things have no connection to any “masers” (i.e. devices that use quantum transition in atoms or molecules). I know 10KHz waves can easily be generated as signals in circuits in bench top devices but that’s different from creating them as self propagating EM waves isn’t it? If not a maser, wouldn’t the antenna still have to be on the order of the wavelength? Thanks. Any conductor can be an antenna. The challenges are efficiency and directivity (gain). Efficiency requires, as you say, size on the order of a wavelength, and it drops precipitously as size decreases. Gain requires even greater size, somewhat in proportion to gain. It gets complicated. Also, efficiency and gain cannot be achieved on the Earth’s surface (or the Moon, etc.) due to interactions which are extremely difficult to manage at this wavelength. Of course a large antenna structure in space is also terribly challenging. Maser – in reality is the method to create COHERENT electromagnetic waves for micrometers wavelenght (non coherent – is much easier), coherent waves can be focused in narrow beam. On 10kHz coherent electromagnetic can be created easily and very with high power and relatively high effeciency ( if compare it with maser’s efficiency). Given the power of the higher DE-STAR numbers (e.g. 4), and its positioning to destroy/deflect asteroids (as well as obvious military applications), I’m a little surprised there is no DARPA or DoD funding mentioned in the timeline. Or is that classified? Of course for such a new material, the question is how to make big sheets of it sufficient for the Starshot. Or a sufficiently rigid Conical Sail to ride the beam. Very interesting article on DE-STAR. It sounds like a very worthwhile and fundable project if we’re going to get probes to the nearby star systems. DE-STAR for planetary defense seems like a non-starter since it would obviously be a very useful weapons system to engage either satellites or ground targets. I though this was why Breakthrough Starshot is focusing only on ground based lasers? The damage that can be inflicted through this kind of tech is almost nothing compared to what can be achieved with much less expensive missiles, of which enough is already available to destroy the planet several times. Plus, such a big structure in space would be very easy to spot and to destroy, should it fall into the hands of mad generals. And last but not least, China is already envisaging to build in 2 years an orbital solar power station which would use microwaves or lasers to beam the collected energy down to Earth. Basically, this is the same kind of tech as DE-STAR, except it’s targeting the ground instead of deep space. I think we should stop doing nothing out of fear of potential military applications, as any technology that generates enough power to send an interstellar probe at a fraction of the speed of light can be misused by the military anyway.